What is Deep Tissue Massage? – Narangkar Glover, L.M.T. A muscle cell, or myocyte, is a long, cylindrical, striated and multi-nucleated cell made up of myofibrils. The functional unit of a myofibril is called a sarcomere: long, fibrous proteins that glide past each other when muscles contract and relax. A muscle fiber is made up of a group of myofibrils, and contains a nerve axon with both a sensory and a motor unit. 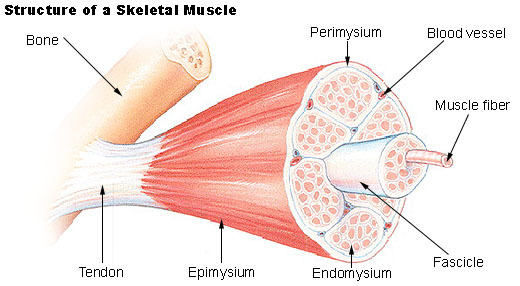 A group of muscle fibers makes up a fascicle, and henceforth a group of fascicles makes up a muscle. Surrounding each of these units is a sheath of connective tissue: Endomysium, Perimysium, and Epimysium respectively. As the muscle narrows, or flattens, these continuous sheaths come together to form tendons, which anchor the muscle to the skeleton. 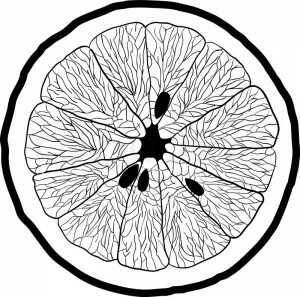 To get a sense of this organization, picture a citrus fruit cut in the cross section. You can see the individual pulp, the sections, the pith, and finally the skin. Now picture all the liquid is removed. What you get is a network of fibrous tissue. This network of connective tissue is broadly referred to as Fascia. And this organization of fascia is consistent with the fundamental organization of tissues and systems throughout our bodies, and even all organisms! Improper posture, repetitive movements, prolonged sitting or standing, strenuous activity, injury, and even emotional stress can cause strain on our muscle tissue. These things can lead to structural issues, mainly tightness and decreased range of motion, which causes tissue restriction. It is possible yet rare–after prolonged dysfunction–to develop adhesions. All of these things–injury-related adhesions, scar tissue or restricted soft tissue–can contribute to the cycle of dysfunction, resulting in limited range of motion and compensation patterns. This is a typical somatic response, which arises from the cerebellum, and is often occurring in the background as we go about our work. In this way, some form of physical manipulation can be a useful intervention for the pain-spasm-pain and myofascial dysfunction cycle. Won’t Swedish Massage be enough? 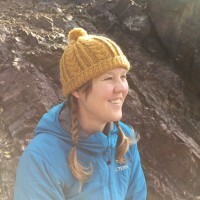 Generally, swedish massage aims to address superficial fascia, that is, the layer of connective tissue which lies beneath the skin, but superficial to muscles, bones and and organs. This is not to say that a good manual therapist will not be skilled at working superficial fascia. Understand that much of our superficial fascia can become adhered as well, thus playing as crucial a role in limiting movement and range of motion. A good swedish massage should feel restorative as well as relaxing. And, superficial fascia is the gatekeeper, so to speak, for access to the deep fascia which lies in our muscles, composes tendons and ligaments, surrounds bone (periosteum), and sits all throughout our viscera. A good deep tissue practitioner will understand this, and will spend some time loosening up superficial fascia before employing deep tissue work. A client will be able to feel the practitioner working layer by layer, and eventually gaining purchase on muscle tissue. The sensation experienced should not necessarily be pain, but deep relief which might be accompanied by some soreness. Because it is deep, it is typical to feel a little bit sore after receiving deep tissue massage. Following the soreness, the client will experience freedom of movement and reduced or all-together eliminated pain. Keep in mind that a deep tissue massage isn’t necessarily just a “strong pressure” massage. If a practitioner is unskilled at accessing the correct muscles within a problematic structure, a hundred pounds of pressure won’t generate effective results. I call this the “steamroller” massage, and myself have been a client of many such unsuccessful treatments of this nature. But after all is said and done, it’s the treatment that offers the most relief that will be the right one for you.